“Perhaps this view of an emerging collective human consciousness is … if it is put forward seriously, it is antihuman and intellectually debasing. The structures of scholarship and learning are based on respect for individuality and the authentic expression of individual personalities. The person who creates knowledge or literature matters as much as the knowledge or the literature itself … An encyclopedia (literally, the Â“circle of learningÂ”) is the product of many minds. It is not the product of a collective mind. It is an assemblage of texts that have been written by people with credentials and expertise and that have been edited, verified, and supplied with a scholarly apparatus enabling the user to locate desired knowledge. It differs in almost all relevant particulars from one of the current manifestations of the flight from expertiseÂ—Wikipedia, which bills itself as Â“the free encyclopedia that anyone can editÂ” and to which everyone can contribute irrespective of whether they possess, or simply pretend to possess, credentials and expertise…” Web 2.0: The Sleep of Reason, Part II by Michael Gorman, Britannica Blog. ” … The Internet – and Wikipedia – change the rules for distribution and production … It means that individuals who know something can easily share it, even when they are not formally declared as experts. It means that those with editing skills can help the information become accessible, even if they only edit occasionally. It means that multi-lingual individuals can help get information to people who speak languages that publishers do not consider worth their time. It means that anyone with an Internet connection can get access to information traditionally locked behind the gates of institutions (and currently locked in digital vaults). 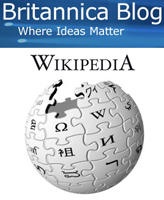 The society that (Dr. Gorman) laments has lost faith in the public good … Wikipedia is a public-good project. It is the belief that division of labor has value and that everyone has something to contribute, if only a spelling correction. It is the belief that all people have the inalienable right to knowledge, not just those who have academic chairs. It is the belief that the powerful have no right to hoard the knowledge. And it is the belief that people can and should collectively help others gain access to information and knowledge.” Knowledge Access as a Public Good by danah boyd.